Siaes Tunnel is a spacious cavern, pushing the limits of recreational diving, but it is well worth the venture into the deeper depths to explore what lies within. Divers are beckoned inside by three decent-size openings along the reef wall, lurking just a little deeper is the largest opening lying at nearly 80 feet (28 meters) that divers use as the entrance to the chamber.The bottom of the cavern lies at 140 feet (45 meters) and the sheer wall upon exiting drops down to 200 feet and beyond. Dropping in on the sheer vertical wall and descending down to 80 feet (28 meters) to enter the chamber is in itself an overload of the senses. Once divers reach 60 feet (20 meters) then the opening becomes evident and curiosity draws you in. Greeted by schools of Big-Eye Jacks, snappers and typically a Gray Reef Shark or two gliding by, divers enter the cavern and can immediately see bushes of black coral lining the top of the cavern. Plenty of light reaches into the depths of the cavern, illuminating the White Tip Reef Sharks and stingrays resting on the bottom. Add to the array of fish and sea fans, the currents don’t penetrate the cavern, leaving divers to explore the nooks and crannies at will and without pressure to leave the macro playground. What lies further inside Siaes Tunnel? Look closely and divers can find some rare angelfish and gobies not found at other scuba dive sites in Palau. Along the sandy bottom look even closer and find paired gobies and their partner shrimp in their shared burrows. Remember to watch your no decompression limits. It’s tempting to stay and play inside the cavern and investigate what lies at 140 feet (45 meters) at the bottom, but what lies beyond the cavern is worth further inspection as well. Inquisitive divers remain enthralled upon exiting the cavern, immediately coming across sharks cruising by the exit. Continue along the wall and take in all the colors of the striking sea fans lurking right outside the cavern. Diving along the wall and drift in the current till the mandatory safety stop near the edge of the reef and exit with smiles. Combine this dive with one of the other unsurpassed dives at Ulong and the day is rarely ordinary. 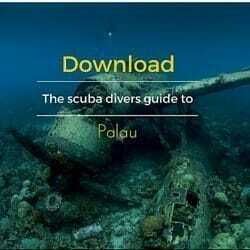 Would you like to dive Siaes Tunnel here in Palau with us?